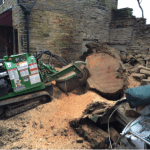 Treesaw is a professional tree surgery undertaking arboriculture in the Bradford area. Our core services include crown cleaning, crown thinning, crown reduction and shaping, crown lifting, pollarding, removal of epicormic growth, removal of deadwood, felling/dismantling of trees to ground level, stump grinding or the chemical treating of stumps using Eco Plugs and tree and hedge planting. Based on our track record of carrying out these services for residents and private sector clients, we are confident that we will be able to carry out every aspect of arboriculture to a consistently high standard. 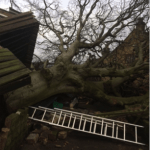 Treesaw removed a fallen Beech tree which had blown over in a storm causing damage to an outside shed and wounding two other trees. When the tree had been removed from the site and hanging branches removed from the other damaged trees, we used a stumpgrinder to remove the remaining stump. Treesaw removed a Sycamore tree to ground level and treated the stump to prevent future regrowth. We also reduced the height and spread of another Sycamore and crown lifted a group of Birch trees to give a clearance from ground level of five metres. We reduced the height of a multi stemmed Conifer tree to approximately 7ft and trimmed two other Conifer trees in the garden to the same height. 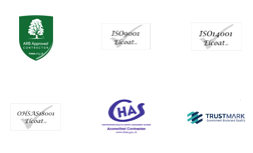 If you would like a free quotation, contact us using our contacts page or call us on 0113 239 1271.